The Guardians of the Galaxy Return! 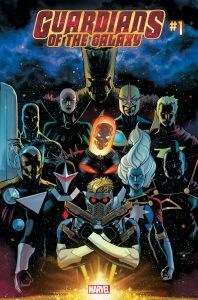 A new adventure for the Guardians of the Galaxy has begun thanks to the superstar creative team of Donny Cates, Geoff Shaw, and Marte Gracia! Today, Marvel is proud to present the trailer for GUARDIANS OF THE GALAXY #1 featuring Editor-In-Chief C.B. Cebulski, writer Donny Cates, and editor Darren Shan!